Personalized messaging stickers let you add audio, video, or photos to any object you like. 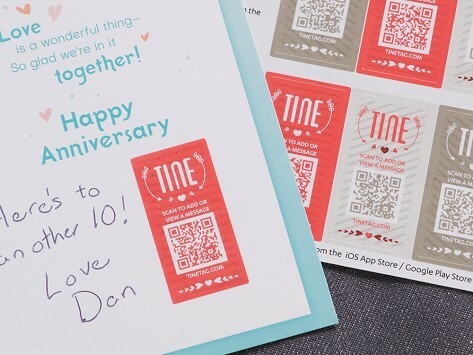 You record the content, link it to the sticker via the TINE app, and whomever you choose can access the content with their smartphone. Bring major personalization to gifts and greetings, add instructions around the house for guests . . . add interaction to anything you can stick a sticker on. These personalized messaging stickers can do the talking for you. Stick one on any physical object to add video, audio, or pictures. Put a voice or video recording in a greeting card. Give guests instructions for your remote control. Add Grandpa’s voice to a storybook. Let gallery visitors learn about the inspiration behind a painting. The uses are as infinite as your imagination. Once you create content, you link it to the sticker via the TINE app. Others can access that content by scanning the sticker with their smartphone. Each sticker uses a QR code—which can store a web address or other info. 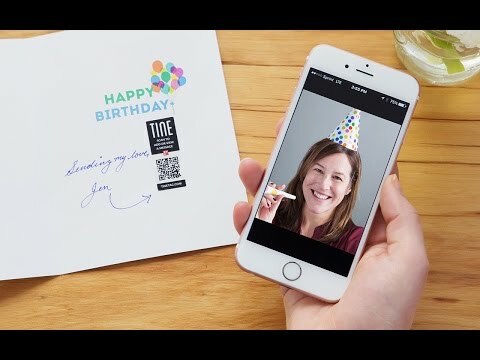 But unlike other QR codes, TINE lets you limit who can see the content. TINE’s Founders came up with their idea while sharing a bottle of wine. Hearing from the winemaker, they thought, would really enhance their experience. Now sharing memories, instructions, messages—or anything you want—is as easy as sticking on a sticker.